Official Moto G6 User Guide in English language (US) is for Moto G6 (Moto G 2018) sold in the US market with Android Oreo 8.0. If your Moto G6 was not bought in the USA, this official Moto G6 User manual in English language (US) may be not for you. You may try the international one (A1). Download link for Moto G6 User guide in English language (US) (in PDF): The official Moto G6 User manual in English language (US) for Moto G6 (Moto G 2018) (English, USA). Official Moto G6 User Guide in English language (US) is for Moto G6 (Moto G 2018) sold in the US market to Verizon customers with Android Oreo 8.0. If your Moto G6 was not bought from Verizon in the USA, this official Moto G6 User manual in English language (US) may be not for you. You may try the international one (A1). Download link for Moto G6 User guide in English language (US) (in PDF): The official Moto G6 User manual in English language (US) for Moto G6 (Moto G 2018) (English, USA, Verizon). Official Moto G6 User Guide in the Danish Language (dansk) is for Moto G6 (Moto G 2018) sold in the European market with Android Oreo 8.0. If your Moto G6 was not bought in Europe, this official Moto G6 User manual in Danish Language (dansk) may be not for you. You may try the international one (A1). Download link for Moto G6 User guide in the Danish Language (dansk) (in PDF): The official Moto G6 User manual in the Danish Language (dansk) for Moto G6 (Moto G 2018) (Danish Language (dansk), Europe). Official Moto G6 User Guide in the Spanish language (español) is for Moto G6 (Moto G 2018) sold in the European market with Android Oreo 8.0. If your Moto G6 was not bought in Europe, this official Moto G6 User manual in Spanish language (español) may be not for you. You may try the international one (A1). Download link for Moto G6 User guide in the Spanish language (español) (in PDF): The official Moto G6 User manual in the Spanish language (español) for Moto G6 (Moto G 2018) (Spanish language (español), Europe). Official Moto G6 User Guide in the French language (le français) is for Moto G6 (Moto G 2018) sold in the European market with Android Oreo 8.0. If your Moto G6 was not bought in Europe, this official Moto G6 User manual in French language (le français) may be not for you. You may try the international one (A1). Download link for Moto G6 User guide in the French language (le français) (in PDF): The official Moto G6 User manual in the French language (le français) for Moto G6 (Moto G 2018) (French language (le français), Europe). Official Moto G6 User Guide in the Italian language (Italiano, Lingua italiana) is for Moto G6 (Moto G 2018) sold in the European market with Android Oreo 8.0. If your Moto G6 was not bought in Europe, this official Moto G6 User manual in Italian language (Italiano, Lingua italiana) may be not for you. You may try the international one (A1). Download link for Moto G6 User guide in the Italian language (Italiano, Lingua italiana) (in PDF): The official Moto G6 User manual in the Italian language (Italiano, Lingua italiana) for Moto G6 (Moto G 2018) (Italian language (Italiano, Lingua italiana), Europe). Official Moto G6 User Guide in the Polish language (język polski) is for Moto G6 (Moto G 2018) sold in the European market with Android Oreo 8.0. If your Moto G6 was not bought in Europe, this official Moto G6 User manual in Polish language (język polski) may be not for you. You may try the international one (A1). Download link for Moto G6 User guide in the Polish language (język polski) (in PDF): The official Moto G6 User manual in the Polish language (język polski) for Moto G6 (Moto G 2018) (Polish language (język polski), Europe). Official Moto G6 User Guide in the Kazakh language (қазақ тілі, qazaq tili) is for Moto G6 (Moto G 2018) sold in the European market with Android Oreo 8.0. If your Moto G6 was not bought in Europe, this official Moto G6 User manual in Kazakh language (қазақ тілі, qazaq tili) may be not for you. You may try the international one (A1). Download link for Moto G6 User guide in the Kazakh language (қазақ тілі, qazaq tili) (in PDF): The official Moto G6 User manual in the Kazakh language (қазақ тілі, qazaq tili) for Moto G6 (Moto G 2018) (Kazakh language (қазақ тілі, qazaq tili), Europe). Official Moto G6 User Guide in the Georgian language (ქართული ენა, kartuli ena) is for Moto G6 (Moto G 2018) sold in the European market with Android Oreo 8.0. If your Moto G6 was not bought in Europe, this official Moto G6 User manual in the Georgian language (ქართული ენა, kartuliena) may be not for you. You may try the international one (A1). Download link for Moto G6 User guide in the Georgian language (ქართული ენა, kartuli ena) (in PDF): The official Moto G6 User manual in the Georgian language (ქართული ენა, kartuli ena) for Moto G6 (Moto G 2018) (Georgian language (ქართული ენა, kartuli ena), Europe). Official Moto G6 User Guide in the Canadian French Language (français canadien) is for Moto G6 (Moto G 2018) sold in Canada market with Android Oreo 8.0. If your Moto G6 was not bought in Canada, this official Moto G6 User manual in the Canadian French Language (français canadien) may be not for you. You may try the international one (A1). Download link for Moto G6 User guide in the Canadian French Language (français canadien) (in PDF): The official Moto G6 User manual in the Canadian French Language (français canadien) for Moto G6 (Moto G 2018) (Canadian French Language (français canadien), Canada). These official Moto G6 Play user manuals are for Moto G6 Play phones only. If your phone is Moto G6 or Moto G6 Plus, please check the other two sections. Official Moto G6 Play User Guide in English language (UK) is for Moto G6 Play sold in international market including Europe, Latin America, Middle East, Africa and Asia with Android Oreo 8.0. If you cannot find the Moto G6 Play user manual in local language for your Moto G6, you may try this one. Download link for Moto G6 Play User guide in English language (UK) (in PDF): The official Moto G6 Play User manual in English language (UK) for international versions of Moto G6 Play (English, Europe, Latin America, Middle East, Africa and Asia). Official Moto G6 Play User Guide in English language (US) is for Moto G6 Play sold in the US and North American market with Android Oreo 8.0. If your Moto G6 Play was not bought in North America, this official Moto G6 Play User manual in English language (US) may be not for you. You may try the international one (B1). Download link for Moto G6 Play User guide in English language (US) (in PDF): The official Moto G6 Play User manual in English language (US) for Moto G6 Play (English, USA and North America). Official Moto G6 Play User Guide in English language (US) is for Moto G6 Play sold in the US market to Verizon customers with Android Oreo 8.0. If your Moto G6 Play was not bought from Verizon in the USA, this official Moto G6 Play User manual in English language (US) may be not for you. You may try the international one (B1). Download link for Moto G6 Play User guide in English language (US) (in PDF): The official Moto G6 Play User manual in English language (US) for Moto G6 Play (English, USA, Verizon). Official Moto G6 Play User Guide in English language (US) is for Moto G6 Play sold in the US market to AT&T customers with Android Ore0 8.0. If your Moto G6 Play was not bought from AT&T in the USA, this official Moto G6 Play User manual in English language (US) may be not for you. You may try the international one (B1). 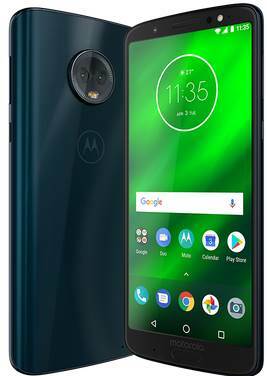 Download link for Moto G6 Play User guide in English language (US) (in PDF): The official Moto G6 Play User manual in English language (US) for Moto G6 Play (English, USA, AT&T). Official Moto G6 Play User Guide in English language (US) is for Moto G6 Play sold in the US market to Sprint customers with Android Oreo 8.0. If your Moto G6 Play was not bought from Sprint in the USA, this official Moto G6 Play User manual in English language (US) may be not for you. You may try the international one (B1). Download link for Moto G6 Play User guide in English language (US) (in PDF): The official Moto G6 Play User manual in English language (US) for Moto G6 Play (English, USA, Sprint). Official Moto G6 Play User Guide in the Danish Language (dansk) is for Moto G6 Play sold in the European market with Android Oreo 8.0. If your Moto G6 Play was not bought in Europe, this official Moto G6 Play User manual in Danish Language (dansk) may be not for you. You may try the international one (B1). Download link for Moto G6 Play User guide in the Danish Language (dansk) (in PDF): The official Moto G6 Play User manual in the Danish Language (dansk) for Moto G6 Play (Danish Language (dansk), Europe). Official Moto G6 Play User Guide in the German language (Deutsch) is for Moto G6 Play sold in the European market with Android Oreo 8.0. If your Moto G6 Play was not bought in Europe, this official Moto G6 Play User manual in German language (Deutsch) may be not for you. You may try the international one (B1). Download link for Moto G6 Play User guide in the German language (Deutsch) (in PDF): The official Moto G6 Play User manual in the German language (Deutsch) for Moto G6 Play (German language (Deutsch), Europe). Official Moto G6 Play User Guide in the French language (le français) is for Moto G6 Play sold in the European market with Android Oreo 8.0. If your Moto G6 Play was not bought in Europe, this official Moto G6 Play User manual in French language (le français) may be not for you. You may try the international one (B1). Download link for Moto G6 Play User guide in the French language (le français) (in PDF): The official Moto G6 Play User manual in the French language (le français) for Moto G6 Play (French language (le français), Europe). Official Moto G6 Play User Guide in the Spanish language (español) is for Moto G6 Play sold in the European market with Android Oreo 8.0. If your Moto G6 Play was not bought in Europe, this official Moto G6 PlayUser manual in Spanish language (español) may be not for you. You may try the international one (B1). Download link for Moto G6 Play User guide in the Spanish language (español) (in PDF): The official Moto G6 Play User manual in the Spanish language (español) for Moto G6 Play (Spanish language (español), Europe). Official Moto G6 Play User Guide in the Italian language (Italiano, Lingua italiana) is for Moto G6 Play sold in the European market with Android Oreo 8.0. If your Moto G6 Play was not bought in Europe, this official Moto G6 Play User manual in Italian language (Italiano, Lingua italiana) may be not for you. You may try the international one (B1). Download link for Moto G6 Play User guide in the Italian language (Italiano, Lingua italiana) (in PDF): The official Moto G6 Play User manual in the Italian language (Italiano, Lingua italiana) for Moto G6 Play (Italian language (Italiano, Lingua italiana), Europe). Official Moto G6 Play User Guide in the Polish language (język polski) is for Moto G6 Play sold in the European market with Android Oreo 8.0. If your Moto G6 Play was not bought in Europe, this official Moto G6 Play User manual in Polish language (język polski) may be not for you. You may try the international one (B1). Download link for Moto G6 Play User guide in the Polish language (język polski) (in PDF): The official Moto G6 Play User manual in the Polish language (język polski) for Moto G6 Play (Polish language (język polski), Europe). Official Moto G6 Play User Guide in the Canadian French Language (français canadien) is for Moto G6 Play sold in Canada market with Android Oreo 8.0. If your Moto G6 Play was not bought in Canada, this official Moto G6 Play User manual in the Canadian French Language (français canadien) may be not for you. You may try the international one (B1). Download link for Moto G6 Play User guide in the Canadian French Language (français canadien) (in PDF): The official Moto G6 Play User manual in the Canadian French Language (français canadien) for Moto G6 Play (Canadian French Language (français canadien), Canada). These official Moto G6 Plus user manuals are for Moto G6 Plus phones only. If your phone is Moto G6 or Moto G6 Play, please check the other two sections. Official Moto G6 Plus User Guide in English language (UK) is for Moto G6 Plus sold in international market including Europe, Latin America, Middle East, Africa and Asia with Android Oreo 8.0. If you cannot find the Moto G6 Plus user manual in local language for your Moto G6 Plus, you may try this one. Download link for Moto G6 Plus User guide in English language (UK) (in PDF): The official Moto G6 Plus User manual in English language (UK) for international versions of Moto G6 Plus (English, Europe, Latin America, Middle East, Africa and Asia). Official Moto G6 Plus User Guide in the Danish Language (dansk) is for Moto G6 Plus sold in the European market with Android Oreo 8.0. If your Moto G6 Plus was not bought in Europe, this official Moto G6 Plus User manual in Danish Language (dansk) may be not for you. You may try the international one (C1). Download link for Moto G6 Plus User guide in the Danish Language (dansk) (in PDF): The official Moto G6 Plus User manual in the Danish Language (dansk) for Moto G6 Plus (Danish Language (dansk), Europe). Official Moto G6 Plus User Guide in the Brazilian Portuguese (Português do Brasil) is for Moto G6 Plus sold in the Brazil market with Android Oreo 8.0. If your Moto G6 Plus was not bought in Brazil, this official Moto G6 Plus User manual in Brazilian Portuguese (Português do Brasil) may be not for you. You may try the international one (C1). Download link for Moto G6 Plus User guide in the Brazilian Portuguese (Português do Brasil)(in PDF): The official Moto G6 Plus User manual in the Brazilian Portuguese (Português do Brasil) for Moto G6 Plus (Brazilian Portuguese (Português do Brasil), Brazil). Official Moto G6 Plus User Guide in the German language (Deutsch) is for Moto G6 Plus sold in the European market with Android Oreo 8.0. If your Moto G6 Plus was not bought in Europe, this official Moto G6 Plus User manual in German language (Deutsch) may be not for you. You may try the international one (C1). Download link for Moto G6 Plus User guide in the German language (Deutsch) (in PDF): The official Moto G6 Plus User manual in the German language (Deutsch) for Moto G6 Plus (German language (Deutsch), Europe). Official Moto G6 Plus User Guide in the French language (le français) is for Moto G6 Plus sold in the European market with Android Oreo 8.0. If your Moto G6 Plus was not bought in Europe, this official Moto G6 Plus User manual in the French language (le français) may be not for you. You may try the international one (C1). Download link for Moto G6 Plus User guide in the French language (le français) (in PDF): The official Moto G6 Plus User manual in the French language (le français) for Moto G6 Plus (French language (le français), Europe). Official Moto G6 Plus User Guide in the Polish language (język polski) is for Moto G6 Plus sold in the European market with Android Oreo 8.0. If your Moto G6 Plus was not bought in Europe, this official Moto G6 Plus User manual in Polish language (język polski) may be not for you. You may try the international one (C1). Download link for Moto G6 Plus User guide in the Polish language (język polski) (in PDF): The official Moto G6 Plus User manual in the Polish language (język polski) for Moto G6 Plus (Polish language (język polski), Europe). Official Moto G6 Plus User Guide in the Georgian language (ქართული ენა, kartuli ena) is for Moto G6 Plus sold in the European market with Android Oreo 8.0. If your Moto G6 Plus was not bought in Europe, this official Moto G6 Plus User manual in the Georgian language (ქართული ენა, kartuli ena) may be not for you. You may try the international one (C1). Download link for Moto G6 Plus User guide in the Georgian language (ქართული ენა, kartuli ena) (in PDF): The official Moto G6 Plus User manual in the Georgian language (ქართული ენა, kartuli ena) for Moto G6 Plus (Georgian language (ქართული ენა, kartuli ena), Europe). Official Moto G6 Plus User Guide in the Kazakh language (қазақ тілі, qazaq tili) is for Moto G6 Plus sold in the European market with Android Oreo 8.0. If your Moto G6 Plus was not bought in Europe, this official Moto G6 Plus User manual in Kazakh language (қазақ тілі, qazaq tili) may be not for you. You may try the international one (C1). Did you find Official Moto G6 User Manual, Moto G6 Play User Manual, or Moto G6 Plus User Manual in your language? If you cannot find the official user manual for Motyo G6, Moto G6 Play and Moto G6 Plus in your own language, please let us know in the comment box below.